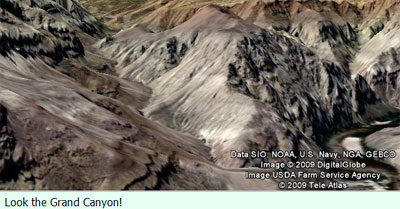 Earthtwit is a very cool mashup of the Google Earth plugin and Twitter. The mashup allows you to browse Google Earth and post an update to Twitter with a link to any location in Google Earth. When your followers on Twitter click on the short URL of the view you submitted they will then be taken to the view in the Google Earth plugin. This is a great way to share your favourite locations or favourite 3D buildings in Google Earth. The same developer, Hussein Nasser, has also created a Google Maps version of Earthtwit. Maptwit allows you to send a Twitter update with a short URL link and message from any location. When your followers on Twitter click on the link they will be taken to the location on Google Maps within Maptwit. 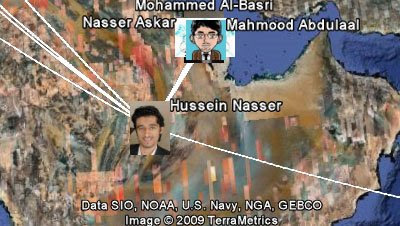 If that wasn't enough Hussein Nasser has also created a new social network with the Google Earth plugin. The application allows you to connect and chat to your friends from within the Google Earth plugin. Users' profile photos are shown on the Google Earth plugin. It is therefore possible to view the locations of your friends directly in Google Earth. It is also possible to see the geographical connections between different users, friend connections are shown by lines between various users. As with Earthtwit and Maptwit it is also possible to send an update with a link to a location to your Twitter account. I've added a new feature to EarthTwit to switch to Sky view and share stars and other plants locations too!